Home » BLOG–NEWS & NOTES » Would You Buy a Used Car From This Man? As it happens, I’m due for a blog post (woefully dragging my heels lately. Can’t even manage two posts per month.). So I thought I’d combine two stones and a bird, or two birds and one stone … something like that, and use my creative writing talents to craft a used car ad and fashion it into a blog post. The time has come to sell Miles (named in honor of the great jazz trumpeter, Miles Davis, who died just before we bought this car), my beloved 1991 Toyota Camry, mainly because we’ve tempted fate for the past five years or so by not replacing him before he conks out on a lonely country road somewhere and forces me to either wait for AAA for three hours, or risk my life and hitchhike home in -20 degree winter weather. A chance to make history and own a car that is unique in a dozen different ways, is nearly a classic, costs very little to maintain in a year, wears its heart on its bumpers, gets 30 MPG around town and 35+ MPG on the highway if you drive near the speed limit. He’s an interesting “fellow” with many and varied interests. 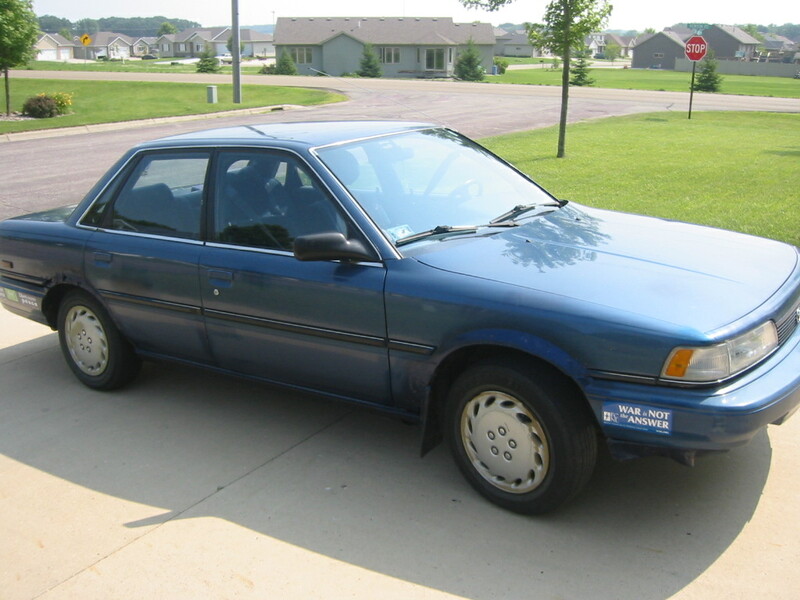 I am selling my 1991 Toyota Camry DX with a 2-liter engine and 5-speed manual transmission with 237,000+ miles driven in almost 24 years. My asking price is $1,000. 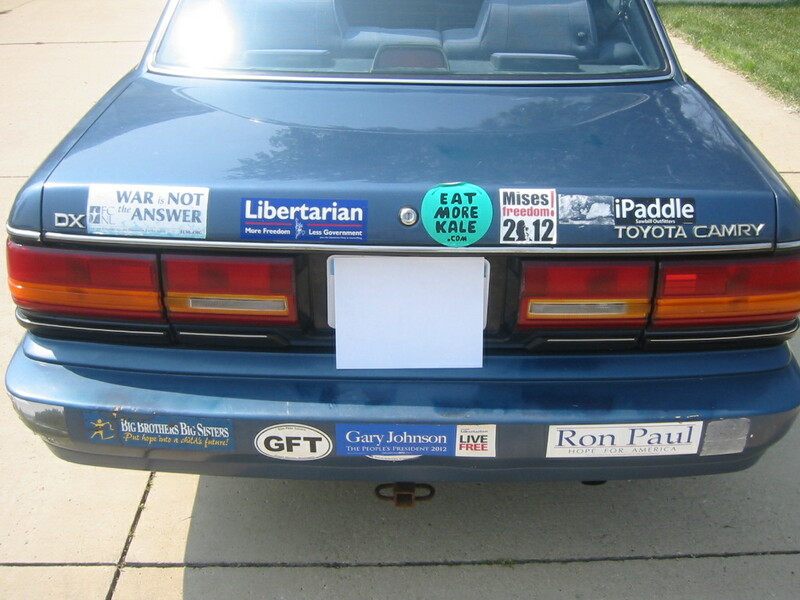 If you want the car WITHOUT bumper stickers, the price goes to $1,500 because it’ll take so long and cost so much in solvent to remove them all. This is a one-owner gem with all its paperwork (maintenance history). It starts in the winter like nobody’s business and has very little rust considering it has spent 24 winters driving in Minnesota. Sure there are quirks and maladies like the radio station display, which may or may not choose to show you what station you are listening to. If it chooses not, all you’ll see are a jumble of electronic impulses flashing across the display. Once in a rare while, the automatic door locking system decides to go on and off five or six times in a row no matter if the car is running or not, or you haven’t even touched the door locks. Speaking of running, the ignition slot for the key is so worn down from the tens of thousands of times the key has been inserted and removed from the ignition, that the key will occasionally fall onto the floor. No worries however because the car will remain running without the key. Sort of like the first keyless ignition. Miles is somewhat of a bionic car, having had several internal organs replaced over the years. Key upgrades include the radiator, water pump, exhaust pipes, brake lines, the horn, and, of course, a few sets of brake pads. Be warned that this car comes with no warranties, either explicit or implied, because many parts are original to 1991. Most notably the clutch. And yes, this IS a Manual Transmission Vehicle! If you’ve never driven a stick before, this is NOT the car you want to learn on. Especially since it does not have a drivers’ side airbag. For that matter, Miles has no airbags and very little in the way of modern safety features like Anti-lock Braking System (ABS) because he came from an era of pioneering risk-takers who weren’t afraid to play chicken with a fully loaded Wal-Mart semi trailer at 55 MPH on an ice-glazed two-lane highway. For that reason, I will NOT sell this car to anyone under the age of 21, because young people who have grown up riding and driving in cars that are essentially tank-like in their protective features will not understand the extra caution that must be exercised when driving a car that has little in the way of protection except a body made mostly of steel instead of aluminum and fiberglass. Miles has managed to avoid major accidents in his long life time. The only exception was a spin out to avoid a drunk driver on Christmas Eve back in about 1993 that bent some of the metalwork under the front end. Other than that, all you find is the aforementioned rust and a couple of parking lot door dings. As with most senior citizens, Miles has a slight problem with fluid retention. He dribbles and drips oil fairly often and needs an extra quart every month or two. For a while, he expelled a few brake fluid farts, but that seems to have been an isolated incident. I will sell the care to anyone who appreciates a loyal ride, dependability, steadiness, experience, and is adaptable to all situations. Miles has driven coast-to-coast, border-to-border, through deserts, up and down mountains, and across the Great Plains of the USA more times than I can remember. I will not be surprised he is still delivering a relatively safe, reliable, economical ride to its new owner when he reaches 300,000 miles. We named him Miles for a reason. If you think you are the next and perhaps final worthy owner of this underappreciated workhorse, give me a call and we can negotiate. 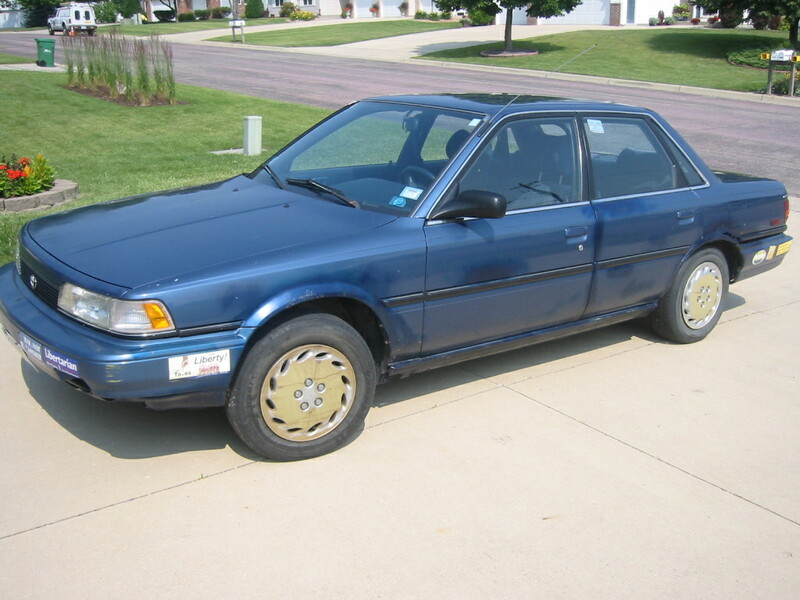 This entry was posted in General Interest and tagged Miles Davis, Toyota Camry by CNWriter. Bookmark the permalink. I really enjoyed this post about Miles. But really, those bumper stickers are too much. Have you written a guest blog for the Trail Baboon? If not, why not? P.S. I took that quip about Miles, like most senior citizens, having “a slight problem with fluid retention,” I took that personally. Thanks, Jane. I did, in fact, do a guest post about Miles a year or two ago on TB. It wasn’t about selling him, just about emotional attachment to inanimate objects, I believe. Last year, a mechanic told me to sell my 2000 Jeep Wrangler and to get something new. This was the reaction I got when I asked him to price out some hefty repairs for me. I went home and cried. And then I asked myself my favorite question: If I had all the money in the world, what would I do? I still have the Jeep. That man never did price the repairs. The heart wants what the heart wants. It seems you made the right decision.Thanks for commenting Jody.